Maseo aka Plug 3 returns Sept 23. We’re really excited for the return of this DJ/producer legend for a ne’er before seen back-to-school jammy jam! He rocked snotboxes galore on his last visit with a mix of classic and contemporary rap, funk, soul, house and disco so if you missed out, this is your chance to get down with the Maseo experience! If that weren’t ’nuff, we’ve also brought on our homey DJ HUNNICUTT into the mix to guarantee that this rumble cannot be clocked! Advance tix are $10 & available at Kustom Kulture, Into The Music and The Urban Bakery. Door admission is $15. 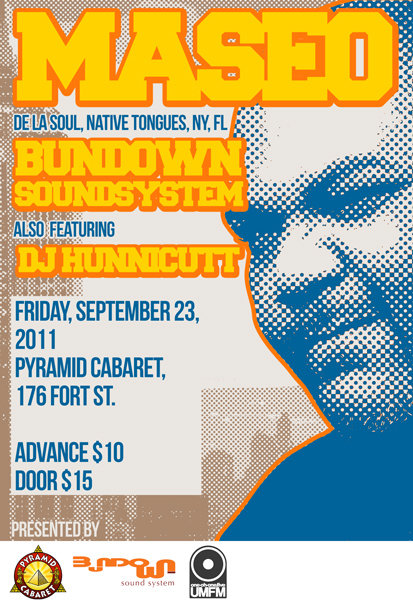 Presented by Pyramid Cabaret, CJUM 101.5FM and Bundown.